Seeking policies that bring greater quality and efficiency to their evaluation systems, many states and districts have begun to tinker with their original blueprints (or adjust their first drafts). 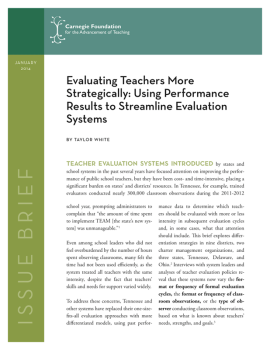 One emerging strategy has been to replace the one-size-fits-all approach with one that evaluates teachers differently based on their prior performance results. This brief explores differentiation strategies in nine districts, two charter management organizations, and three states, Tennessee, Delaware, and Ohio. Though districts approach evaluation differently based on their goals and resources, three major trends have emerged as differentiation has become an increasingly popular options: varying the frequency or format of evaluation, varying the frequency or format of classroom observation, and using multiple evaluators. This is the first in a series of reports on issues emerging from new teacher evaluation systems in states and school districts. Read the second brief, Adding Eyes: The Rise, Rewards, and Risks of Multi-Rater Teacher Observation Systems.